Halloween is the season of spooky costumes, scary movies, and frightening house displays. It’s also the season of nightmares from an oral care standpoint, as the season is so rife with sugary snacks and candy, it practically becomes a food group in some circles. What’s more, the scourge of oral care-disrupting sweet stuff doesn’t just rear its ugly head on October 31. The ever-increasing popularity of the holiday has pushed the potential consumption of these bad goodies into something that could last a couple weeks before and after the big day. However, deploying good oral care doesn’t have to be a lost cause. In this day of promoting healthy eating habits in children, you may be ever so slightly tempted to not have your kids participate in receiving candy during Halloween. However, this deprivation is not the answer. Trick-or-treating is a childhood rite of passage; one that could easily foster into a cherished family memory. Besides, totally cutting your kids off from sweets may backfire, as they’ll be even more tempted to explore why the candy is so nefarious. With that being said, you shouldn’t let your children go hog wild eating candy on and around October 31. Limit the amount of treats your kids enjoy, and when you do issue them, take that time to reinforce the importance of good oral health. This could also translate to helping your kids understand that eating too many sweets could be detrimental to their overall oral health – and their physical health as a whole. Giving Halloween candy to your kids is a treat. However, you should carefully plan when you should dole the treats out. 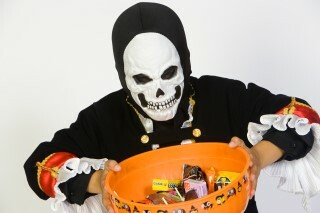 Specifically, it’s wise to have your children consume their Halloween candy with meals or right after mealtime. The reason for this is purely functional in nature. Saliva production increases during meals, and this extra level of production translates into added protection from the bacteria-causing acids and sugars that may infiltrate the mouth through sugary sweets. There may be no better time than Halloween for a parent to reinforce the importance of practicing good oral hygiene habits with their kids. Remind them that brushing and flossing on a routine basis is vital to preserving their teeth for Halloweens yet to come. It’s also a perfect time to remind them that not following through with properly executed basic oral care tactics could put them on in a truly scary situation – in a dentist’s chair, waiting for a cavity to be filled. While your children enjoy their candy, you can also reinforce another habit that’s important to oral hygiene – drinking water. Doing so will help wash away a candy’s sugar from the teeth before it has a chance to settle onto the enamel. And the beverage of choice to do this has to be water; sugary drinks like soda or sports drinks defeats the purpose entirely. Is There Any Candy That Should Be Avoided? While you shouldn’t keep your kids from enjoying Halloween candy, there are some candies that you may want to discourage them from eating. Excessively chewy candy like taffy can stick to and in between a child’s teeth and could cause all kinds of issues, particularly if the child hasn’t fully mastered the art of brushing teeth thoroughly. You may also want to discourage the consumption of hard candies, as they tend to stay inside the mouth for much longer periods of time. Halloween is a fun holiday for kids. It’s important to remember this even as you’re reinforcing good oral care habits to your children. If you work to preserve Halloween’s fun factor while you tend to their oral care needs, they’ll be more likely to embrace the importance of oral hygiene as part of the process. And that’s not scary at all.